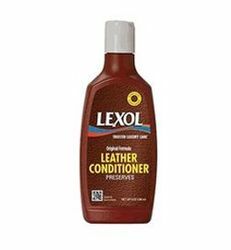 Lexol Conditioner cleans, softens and protects your leather goods. Great for jackets, handbags, shoes and car seats. Excellent for older leather goods, Use thin coats and let dry and then buff. Conditions the leather without leaving it tacky or oily feeling. Not appropriate for suede or nubuck just leather with a finish. The Lexol brand is well known and well liked. Preserves, prolongs and protects.